Whether you have your own faith blog or simply want to study the bible in a new and different way, writing devotionals can help you firm up your faith and share Christ with others. Years ago, when I first began blogging it never occurred to me that I could write a devotional. All of the ones I read were beautiful, faith-filled, and way deeper than I ever thought I could be. You might be thinking the same thing now, that you don’t know enough or have a faith strong enough to write devotionals the way someone else does. Truth is, you won’t write them the way someone else does, but that doesn’t mean Christ won’t work through your words. When you allow Him to guide your writing, it IS as beautiful, faith-filled, and deep as any other writer’s. It’s just hard to believe sometimes, isn’t it? But it’s true. I promise. Now, devotionals come in all shapes and sizes. I’m going to teach you about writing what I consider a pretty standard devotional. There’s a formula I follow behind it, but you can always adjust and customize as you feel led. Open yourself up to ask God in. Invite Him to be a part of your writing session, and ask Him to lead in where He wants you to go. 3. Read each verse three times, once silently, once out loud, and one more time silently. 4. Reflect on the words and say another prayer that you will be able to understand and properly convey His message through your writing. 5. Write without stopping to think about the words you’re putting down. Let them flow as you share the message(s) you hear from God about the scripture. You can (and should) go back and neaten things up, but at this point let God’s words flow through you. 6. End with/write a finishing Prayer. When you finish writing, pray again. Write the first part of this prayer as an end to your devotional. Then, keep praying. Thank God for letting you be His vessel. Ask that your words reach the audience they are intended to. That audience may be solely you or it may be others. That will be for you to decide, but if you think you might want to write for others don’t let fear of not being ‘as good as’ other faith writers keep you from sharing. 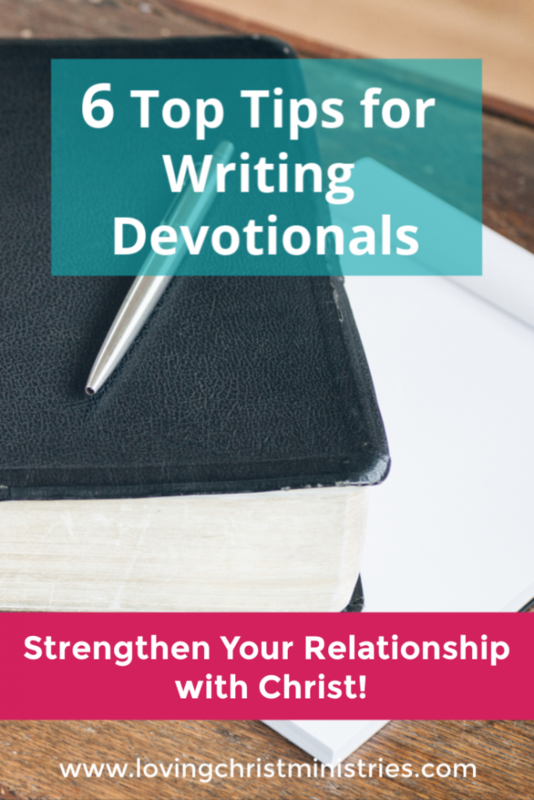 You can be assured that with Christ guiding your devotional writing session, your words matter. Wonderful tips! I love how you bathe every part in prayer (and encourage editing!). It’s a good reminder to me that I can always add more prayer to the process! Amanda, it truly keeps me on track! Hi Connie! I have always used the whole scripture, but I like the idea of focusing on one power word and expanding from there. I may have to try that! Do you have a theme or scripture assigned to you for your March writing, or will you need to pick your own? This is so encouraging and practical, Julie! Thanks for these tips. I think I will implement them when I feel stuck on one of my bigger (40 days) writing projects. They really help me! I sure hope they help you, too! Love this, Julie! I’ve been wanting to write devotionals as well to go along with my blog purpose but wasn’t sure how to go about it. I love your tips and with prayer, I see that this is something I can do as well. Thanks so much! How encouraging! This was good for me to read, as I am just now starting my devotional writing journey. I too struggle with self doubt thoughts. Love your ideas you mentioned, especially reading each verse 3 times, in different ways. Thanks for the encouragement! I’m so glad you stopped by, Leah! Bless you!